We started a few shows back doing a drive-by shooting (except in a good way). In this effort, we pair up on a golf cart with Videoman Dave running the camera and yours truly trying my best to keep up and not flub my lines. All this is extemporaneous (a fancy word for un-scripted) so if I stumble now and again with an airplane fact, please pardon the error. We like to knock these out and that doesn’t allow for retakes. I think I got most of it right or at least Dave managed to edit out any disqualifying errors I may have made. According to new Sebring Expo Program Manager, Janice Rearick, we have a few facts to pass along from Sebring 2018. More than 100 exhibitors displayed their wares. 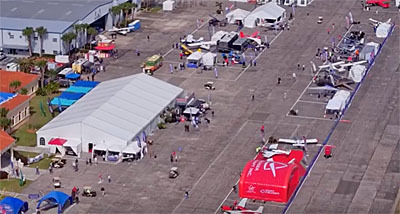 As mentioned in our earlier report, a good number of aircraft were sold and Janice indicated, “Several vendors we surveyed waved long sheets of leads collected at the show.” When vendors succeed, we pilots get more and better aircraft choices with better service from healthier companies. Overall activities were aided tremendously by a small army of 300 volunteers. Many airshow regulars have often heard that these shows cannot happen without those volunteers so when the chance presents itself, give a thank-you to any volunteer you meet. Over 700 people attended more than 60 forums in four tents (though some may have been counted twice if they attended more than one). 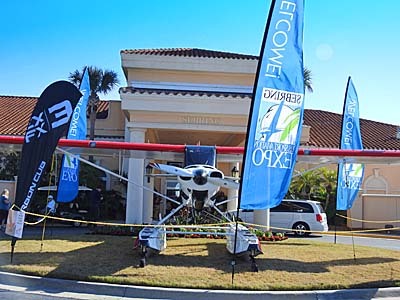 Nearly 1,000 kids were transported to Sebring’s Expo as part of their YAZ, or Young Aviators Zone. I observed several of these flocks and it’s always great to see young people being exposed to aviation. 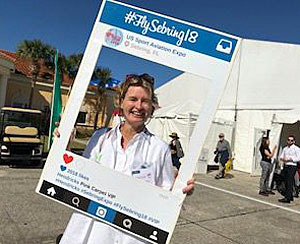 Sporting a Sebring social media promo is Bettina Cosima Larrarte of the wonderful World Directory of Leisure Aviation. Finally, welcome also to new airport manager, Zach Easton, reporting to longtime airport director, Mike Willingham. Zach will likely take the title of Expo Director, said Janice. If you can attend Sebring Expo in 2019 the dates have been announced as January 23-26. For those who could not attend the 2018 event, here’s our race-around video. I urge you to visit Videoman Dave’s YouTube channel and, more importantly, subscribe to help support the production of these videos that people love. He reported the channel is now generating 2.5 million minutes per month of viewing!